In reading workshop, book clubs provide a structure for meaningful, purposeful conversations about books. Students meet regularly in small groups to study and talk about a book they are reading together. As kids read, they are encouraged to stop and jot from time to time to gather ideas and text-evidence to support their thinking. In this way, book clubs provide an authentic purpose for reading closely, note-taking, and writing about reading--to prepare for great conversation. Students decide what they will talk about, how much they plan to read, or what strategy they will practice. They make a plan for the work they’ll do, drawing on all the strategies they’ve been introduced to through minilessons, small group work, and conferring. Students carry out their work independently, with coaching, reminders, and suggestions from the teacher. Often, students pause to self-assess how their reading is going, and how their book club conversations are going. This self-assessment leads to reflection and setting new goals as readers and book club members. to think ahead about book club and come prepared for a great conversation. to practice speaking and listening skills in a meaningful context. to give each other helpful feedback, peer to peer. to elaborate on or revise their ideas and engage in healthy debate. to empathize with other club members. to self-assess, reflect, and set new goals for themselves as book club members. Much like adult book clubs, the conversations often push students to think about the book in a new way. Though listening to each other, students grow new ideas that may not have come up had they not had the conversation. But getting there takes lots of practice. 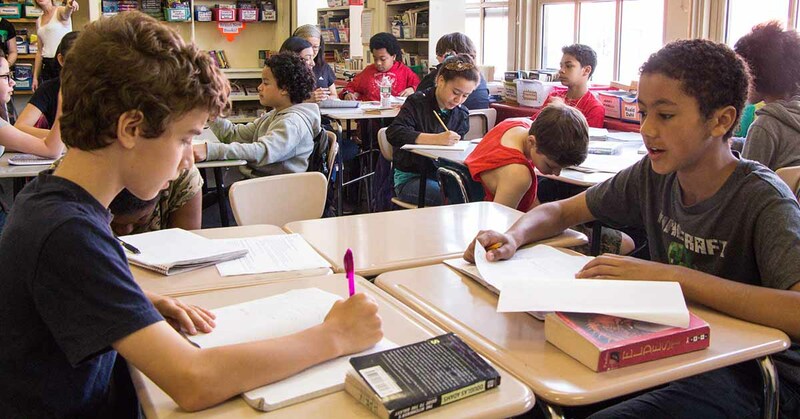 Initially students may need prompting and support to get a conversation going, keep it focused on on track, and to support their thinking with text evidence. The Units of Study for Teaching Reading provide step-by-step support in getting book clubs up and running, and continuously lifting the level of book clubs once they’ve been launched. Each Wednesday night at 7:30 pm EST the Teachers College Reading and Writing Project hosts a Twitter chat using the hashtag #TCRWP. Join hosts Katy Wischow @kw625 and Audra Robb @audrakrobb to chat about building more powerful book clubs. Elizabeth Moore, literacy consultant and coauthor of two books in the Units of Study for Teaching Writing and Units of Study for Teaching Reading series, has been a first grade teacher, fifth grader teacher, literacy coach, and lead staff developer at TCRWP. She has also served as an adjunct instructor in the Department of Curriculum and Teaching at Teachers College, Columbia University. Currently she lives in the mountains of northern Vermont where she finds adventure around every corner.